Ever think about using your smartphone for video? These days, smartphones are proving to be a valuable tool for video. 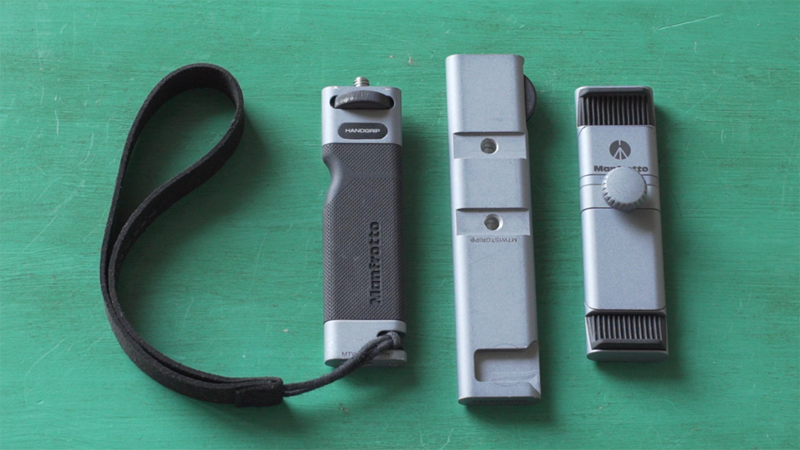 They’re compact, they’re portable, and they’re already in our pockets! And, they’re connected to the internet! While the cameras in our phones are constantly improving, there are a few trade-offs compared to using a traditional video camera. But, with a few modifications, you can really take your smartphone game to the next level for video. The Manfrotto TwistGrip System is a smart solution for mobile journalists who demand top performance from their camera phones. The pieces are small, so it’s easy to store them in a purse or pocket. It doesn’t feel like a big commitment to carry them with you, so, it’s great you can be ready for anything at a moment’s notice! While the TwistGrip System is small, it is mighty. The pieces are constructed in Italy and made out of aluminum. They have a such a sleek, stylish look and feel. They are certainly not your average camera mounts. The system is comprised of three pieces: the TwistGrip, the HandGrip and the BaseGrip. The TwistGrip is a phone mount with an innovative design—it starts out flat and becomes 3D, thanks to its’ unique twisting design. The mount offers storytellers a compact and portable tool to transform their smartphones into more of a proper camera. The TwistGrip has a cold shoe mount on the top to add accessories—like a tripod, a light or microphone—and it has a quarter inch attachment on the bottom, to mount the TwistGrip to other camera supports. 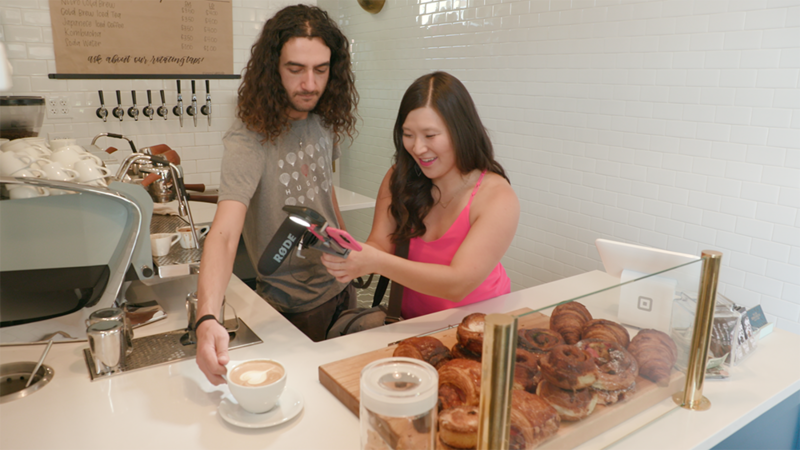 The HandGrip is exactly that—a handle for your phone. There’s a rubber grip for comfort, and there’s a small indent to rest your index finger—so you know which direction faces forward. 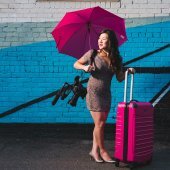 It has an attachment on the bottom to attach additional camera supports, like a tripod, and it has a quick wheel for fast tightening. The BaseGrip is the middle section of the set. There are two options for mounting the HandGrip–in the center or off-center, to help with balance. Grooves keep the HandGrip in place, so the pieces won’t twist accidentally. On the top, you have a mount for the TwistGrip on one end, with a quick wheel for tightening. On the other end, you’ll find a double-sided cold shoe! So, you can add a camera accessory upright or upside-down or both. There are two main ways to get set up. I recommend mounting the TwistGrip to your phone first. For the simplest set up, mount the BaseGrip directly to the Twistgrip to add a handle for holding the camera. It’s great for filming in everyday situations because it’s so low profile—you won’t attract a lot of attention with this simple set up. 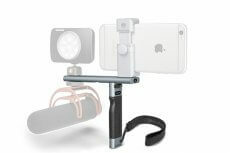 And, you can add your favorite accessory on the TwistGrip’s top cold shoe mount. To experience the full system, attach the HandGrip to the BaseGrip. Choose whether it makes sense to use the attachment in the center or off-center for balance. If you plan to use the top two cold-shoe mounts, the center position tends to be a good choice, but if you plan to attach two accessories on one side–one upright and one upside down—it makes sense to position the HandGrip off-center. Of course, it all depends on which accessories you add. Next, attach the TwistGrip to the BaseGrip, using the quick wheel. Now it’s time to one, two or three of your favorite accessories! With three cold-shoe mounts—you have some flexibility on where you want to position everything. For starters, I recommend adding a light and microphone. Whether you’re in a tough low-light situation or you want to fill some shadows, an on-camera light will give you a bump of light when you need it the most. 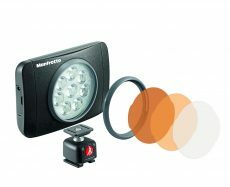 Manfrotto’s LED Lumi Muse 8 is a surprisingly powerful and compact choice. While smartphones generally capture some pretty nice visuals, the audio is where they fall short. Whether you want to film an interview or capture natural sounds, I highly recommend investing in a quality microphone. There are many to choose from made specifically for your phone. Here’s a tip—make sure you have the right connection cables! 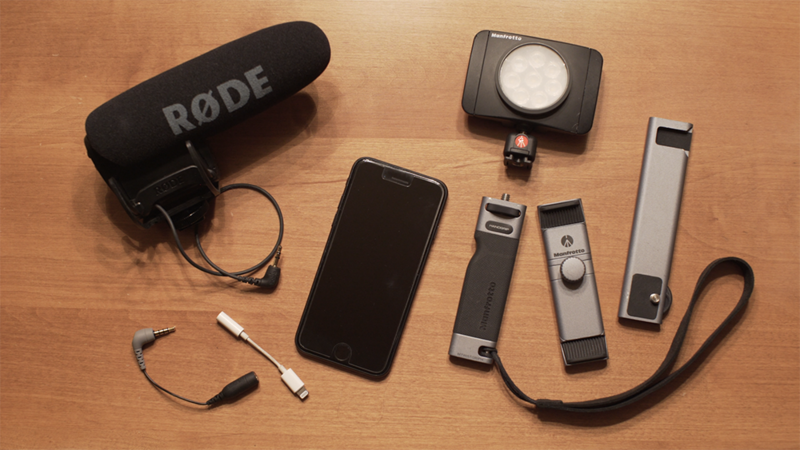 For example, filming with an iPhone 7 and the Rode VidMic Pro, you’ll need the Rode SC4 TRS to TRRS cable for everything to work properly. An on-camera shotgun microphone can help you hear the sounds you want to hear—and the TwistGrip System offers multiple places for positioning. The TwistGrip, HandGrip and BaseGrip combo has such tiny footprint, but offers enormous options. It’s unique, portable and versatile design caters to those who need to capture content on the go. Whether you’re catching breaking news, livestreaming, or creating artistic iPhone stories, the TwistGrip is a nice tool to have in your back pocket. Find more great stories from Juliana Broste, @TravelingJules on Facebook, Instagram, and YouTube! Happy snapping!